The Tascam DR-07 feels very smooth, light and pleasant in the hand. The body is plastic except for 4 tiny rubber feet on the back. At 2.2" x 5.3" x 1.1", it can easily fit in a coat pocket, backpack or briefcase. The DR-07's backlit LCD screen is very clear, coherent and easy to see given its size. It's almost twice the size of the Zoom H2 screen. The buttons are crisp, responsive and very clearly laid out. We also like the fact that there aren't too many of them. We get the impression that the DR-07 is Tascam's lighter, slightly chunkier answer to the Olympus LS-10, at half the price. The 2GB SD card is a nice addition, but a neoprene protective case, like the one Tascam includes with the DR-1 and DR-100, would have been nice. The optional Tascam PS-P520 can be used as an AC adapter power supply. The Tascam DR-07 is very easy to use. The built-in tripod mounting hole in the back of the unit makes it easy to set up anywhere. Press the RECORD button once to go into REC PAUSE mode. Adjust the input level from the built-in microphone, MIC IN jack or the LINE IN jack with the REC LEVEL dial. Use the OUTPUT '+' and '-' buttons to adjust the volume output from the Headphone/LINE OUT jack. Press the REC button again to record. Press the STOP button to stop. Press the PLAY/PAUSE button to listen to the file. Navigation through the DR-07's menu tree is elegantly accomplished with a wheel on the front of the unit, the center of which is the PLAY/PAUSE/ENTER button. Anyone comfortable with a file/menu interface on a computer will figure it out quickly. Turning the wheel is much easier on the thumb than clicking a button dozens of times. Our favorite feature of the navigation wheel is being able to fast forward or rewind very precisely to a location in any file you've recorded. The DIVIDE function also lets you split a file very precisely. Very nice. The Tascam DR-07 can write files up to 2GB and accept SD media cards up to 32GB in size. It records mp3 files from 32-320 kbps and wav files up to 24-bit/48kHz. We wouldn't be surprised if a firmware update increased the wav file sample rate capability to 96kHz. The USB 2.0 connection is very fast. What's the difference between the DR-07 and the DR-1/GT-R1? The DR-1/GT-R1 models have an additional 1/4" input, slightly quieter built-in mics and features like overdubbing, effects layering and guitar training. 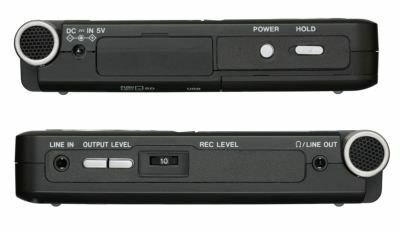 They are also powered by a proprietary Tascam BP-L2 lithium ion battery rather than AA batteries. If you don't need the extra features, can live with the slightly higher noise floor and prefer the more convenient option of using AA batteries, consider the DR-07 and save yourself $100. More information can be found in the Tascam DR-07 owner manual. Excellent. During our battery life test, the Tascam DR-07 lasted 7.5 hours. The Tascam DR-07 sounds good, but we found ourselves wishing that the built-in mics were quieter. The plastic housing also generates quite a bit of handling noise. You will need a tripod or mic stand. To our ears, the DR-07 built-in mic has a clearer high frequency and a more neutral bass response than the comparably-priced Zoom H2, but the trade off for better frequency response at this price point seems to be more noise. With its built-in mic, the Tascam DR-07 may be best for loud sound sources or less critical applications like lectures, music lessons and rehearsals. The options increase with an external mic or external mic and pre-amp. Take a listen. All of our tests were made at the HIGH GAIN setting. 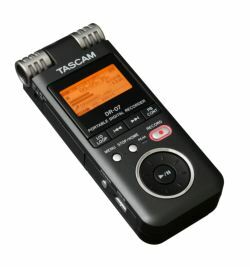 The Tascam DR-07 is a good, affordable and easy-to-use recorder. We wish the built-in microphone was a little quieter, but we are happy to add it to our selection of portable recorders.